Nestled in heart of the Old Town, this beautiful and spacious 3rd floor apartment boasts 2 separate bedrooms with a separate living room making it ideal for 2 - 3 couples. The apartment was renovated in January 2018, and has all new furniture. The turn-of-the-century building (1904) is in immaculate condition with restored frescas at the entrance and has a new elevator which leads up directly to your door. The kitchen is fully equipped with oven and 4 burners, fridge, freezer, dishwasher, microwave, toaster, coffee maker and breakfast table. The living room is fully equipped with flat screen satellite tv, dvd player, stereo and has high-speed wifi internet. There is a large couch for relaxing, dining table and unfoldable double couch bed. The bathroom is very spacious with double sink, toilet, bidet, bathtub and shower. The whole apartment has central heating and also gets great light. This recently reconstructed turn-of-the-century building lies in the heart of Old Town just 200 meters from Old Town Square and 50 meters from the 12th century Church of Saint Havel. The building is neat, secure and clean with an elevator which opens you straight onto the door of your apartment. The entry hall is spacious and leads into the kitchen on the east of the apartment and living room which faces onto Havelska street to the west. The kitchen receives wonderful morning light which makes it perfect for a sit down breakfast. The kitchen is fully equipped with gas top stove, microwave, dishwasher, coffee maker, toaster, large fridge and freezer and all the plates and cutlery necessary for a large group. The living room is also spacious and has a large L shaped couch and an additional double unfoldable couch with full bedding underneath. There is a lovely dining table which can be unfolded to accommodate 6 people. There is a hifi system with CD/DVD and MP3 (USB port) playing capabilities. There is a flat screen TV with satellite and DVD player for those wanting to relax in the evening. There is secure high speed internet throughout the apartment. The bathroom is spacious and boasts all the amenities of a high quality washroom with shower and bath, double sinks with ample storage underneath and toilet and bidet. All guests receive ample fresh towels and wash clothes and there are thick bath mats on the floor. The first bedroom faces onto the backside of the building and is cozy and quiet. There is a large double bed (King sized) and wardrobe for storage. Both sides of the bed have nightstands with reading lamps. There is also an unfoldable single couch bed to accommodate children or members of a larger group. The master bedroom is a beautifully furnished room with a double bed (queen sized), full length wall wardrobe and large chest of drawers. Both sides of the bed have nightstands with reading lamps. Thick curtains will stop the morning light. The bedroom also boasts the best view from the apartment with a sneak peak at the castle on the other side of the river. Havelska street is in the heart of Prague's historic Old Town. Just 200 meters from the Old Town square and the metro stop Mustek means that you have easy access to everything to see in Prague. Start your day with a coffee and fresh pastery followed by an early morning walk to the Old Town Square to avoid the crowds. There are tons of cafés, restaurants, bars, shops and everything else you could want as you are in the middle of Old Town. Try the famous U Provanice pub for the real Czech cuisine and more important beer which is located 1/2 block away. If wine is more your thing then sample the selections at U Zavoje also located on Havelska street. Buy your fresh produce at the market on the same street which also has a bakery. The beauty of this part of Prague of course is the fact that you are in the center but just off the main strip where thousands of tourists pass along each hour. Centrally located, but quiet means you can relax but also reach any landmark within minutes. The castle is just a 20 minute walk or hop on the metro and go 2 stops circa 10 minutes. The apartment is also 1 block away from the busiest shopping street Na Prikope with brand name products like Hugo Boss, Benetton, Next, Mango, Zara and Ecco to name a few. There is also a massive, modern shopping center - Paladium just a few hundred meters away. If you are interested in the arts you are just 100 meters from the prestigious Stavovske Divadlo where Mozart conducted his world premiere of Don Giovanni in 1787. The national Opera House is just a 10 minute walk up Wenseslas Square and the National Theater a 10 minute walk through the Old Town side streets (TIP: bring your map). There is a wonderful Balkan Mediterranean restaurant called Kogo - also on Havelska - which offers fresh fish and pasta dishes. Have been in the real estate and travel and tourism industry for over 15 years. We pride ourselves on customer service and providing and amazing experience for anyone visiting Prague. The building is located in the heart of Old Town and is the perfect spot for exploring the golden city. Spacious, clean and quiet this apartment is ideal for couples, families and groups. This location is unbeatable. It's literally just round the corner from the Old Town square. Only a 1 min. walk from the apartment front door. Still the apt. is very quiet. Petra & Vladimir made staying in Prague so easy for us by working with us ahead of time and taking care of all our needs. The apartment is spacious and lovely. The location is ideal for walkers as we were able to get to everything on foot and we so loved discovering the incredibly historic city of Prague. We would stay here again in a heartbeat. Thank you so much! Thank you so much for taking the time to review the apartment. I am glad you enjoyed your stay and your visit to Prague. We absolutely LOVED this apartment in Prague! My husband and I stayed here with our two adult children and it was perfect for us. It's a lovely, large apartment in a fantastic location. We loved our visit to Prague and if we go back again (which I expect we will) we hope to stay here again. Another thing that we really appreciated was that they arranged to have someone pick us up from the train station upon arrival and that the arranged for someone to drive us to the airport when we were returning home. Additionally, prior to our trip I contacted the owner and he gave us a bunch of restaurant recommendations that we found helpful. 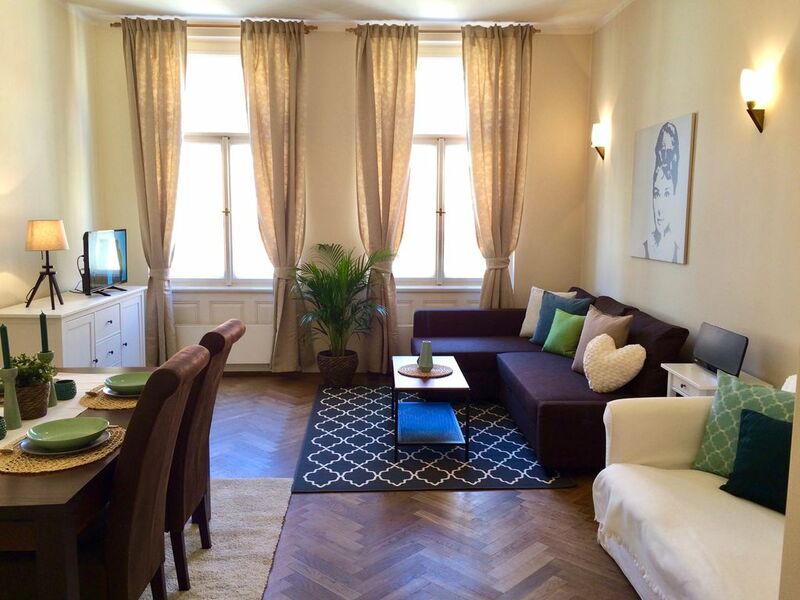 We would most definitely recommend this apartment to anyone visiting Prague! Nice building, safe apartment. Two comfortable bedrooms, very spacious with dining tables in both living/ dining room and kitchen. As pictured. Well equipped but bring your own sugar, salt, pepper etc. as cupboards were bare of any food items. Also bring own shampoo etc. Theres a daily market on the street below that sets up quite early with some noise so bring ear plugs if you’re sensitive. Vladimir is the property manager and also driver. Very good, friendly and helpful. Speaks fluent English. Good car. We hired him for a day trip outside the city and he was great. Use him for your airport transfers too. We would go again. Thank you so much for the positive review. I am glad you enjoyed your stay and your visit to Prague. Great place to stay in Prague and you couldn’t ask for a better location. Host was very friendly and responded to our requests right away. Will stay again at this apartment if we are ever in Prague again. Thank you so much for the kind words. I am glad you enjoyed your stay and your visit to Prague and would be happy to host you again in the future. Felt like a home away from home! Central to downtown Prague attractions, very convenient, clean and user-friendly! Would recommend to anyone!!! Thank you so much for taking the time to review our property. I am so glad that you enjoyed your stay and your visit to Prague. Thank you for the positive review. I am so glad you liked the apartment and enjoyed your stay in Prague.